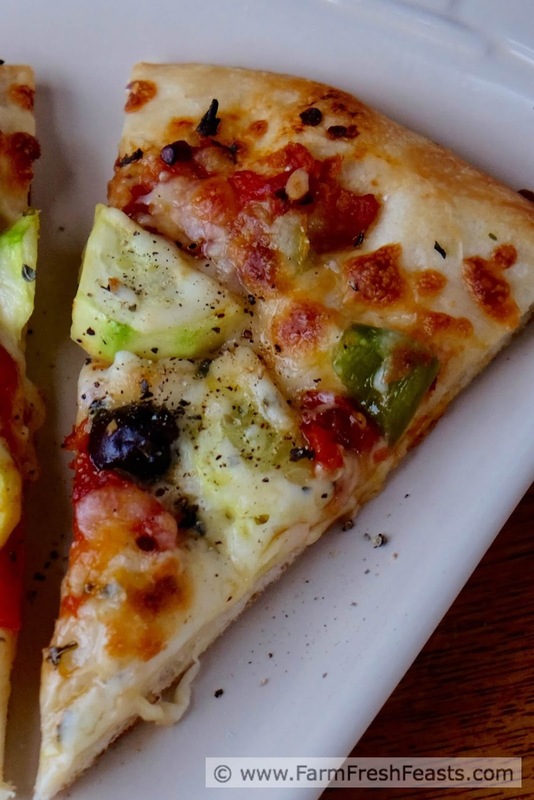 This pizza is a vegetarian's mid Late Summer Dream. 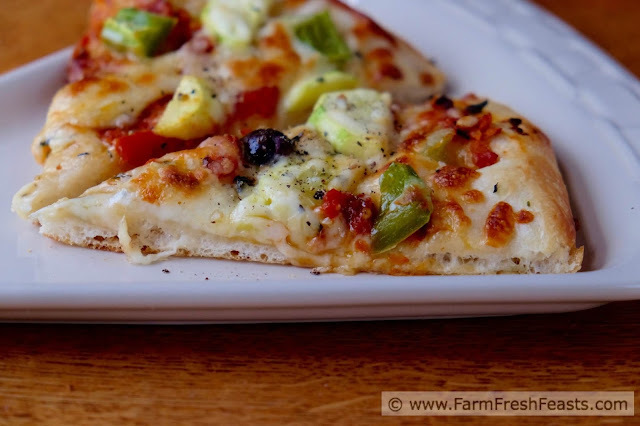 Squash, peppers, olives and slow-roasted tomatoes covered with cheese. My strawberry patch is growing summer squash/zucchini volunteers, not strawberries. 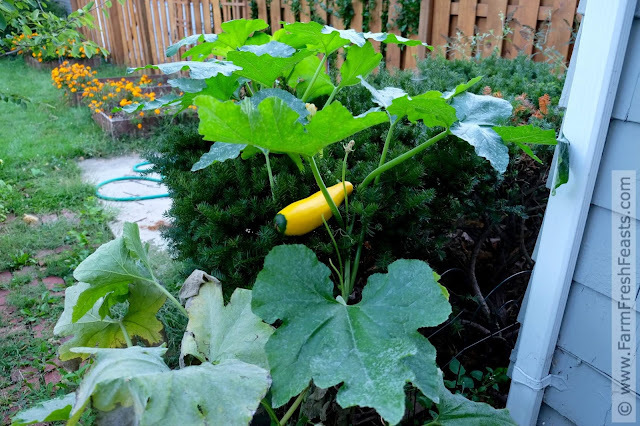 I didn't really expect strawberries to grow at the end of summer, but squash? Eh, I'll run with it. It may seem like I am on a roll with pizzas. No pun needed there--if you saw my photo collages in my Pizza Primer post you'd know I don't use a rolling pin to make pizza. No need [the fingers hovered over k-n-e-a-d . . .] as I just use my hands to push/pull the dough into the shape it wants to be. Perhaps that's what comes with having teenagers? I know that I can still help guide them a bit, but ultimately they are in charge of their final shape, not me. I continue to help guide my readers in ways to use and put up seasonal produce. This week our Community Supported Agriculture farm share farmers canned 100 pounds of tomatoes outside over a fire. That's 37 quarts, people, and a mere one time energy outlay in return for a year of shelf stability. Canning tomatoes is awesome. You know another excellent way to put up tomatoes? Slow-roasting them. With cooler evenings, this time of year is more tolerable in the kitchen than the height of summer. 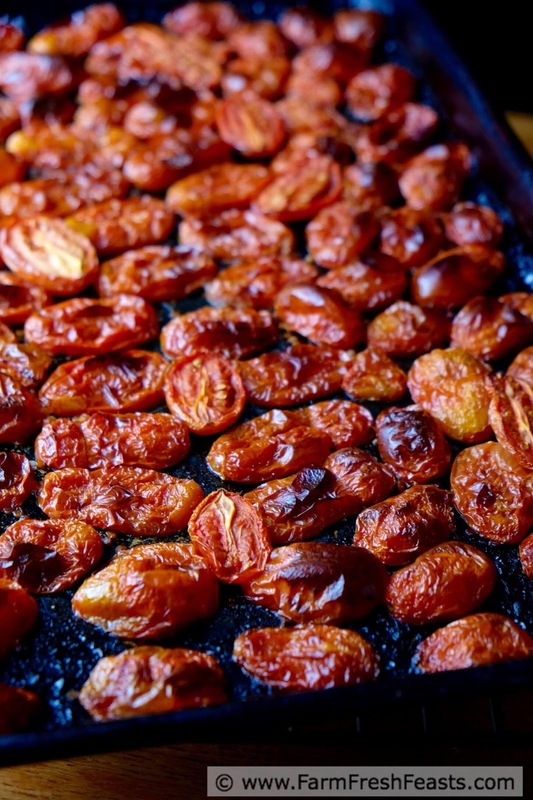 Alanna's tutorial on slow-roasting tomatoes is my guide. I'm here with suggestions on how to use that bounty, and since it's a Friday that means pizza. For other ideas on how to use and put up tomatoes, please see my Tomatoes board on Pinterest and my Red/Yellow Tomato Recipe Collection, part of my Visual Recipe Index by Ingredient, a resource for folks like me eating from the farm share, farmer's market, or garden abundance and rogue volunteer squash in the strawberry patch. For more pizza recipes I've got the Visual Pizza Recipe Index and the Friday Night Pizza Night Pinterest board. Wanna know how to use this blog? Click here. Preheat oven to 450 degrees, and use a pizza stone for best crust (mine is blackened and broken and I love it so). 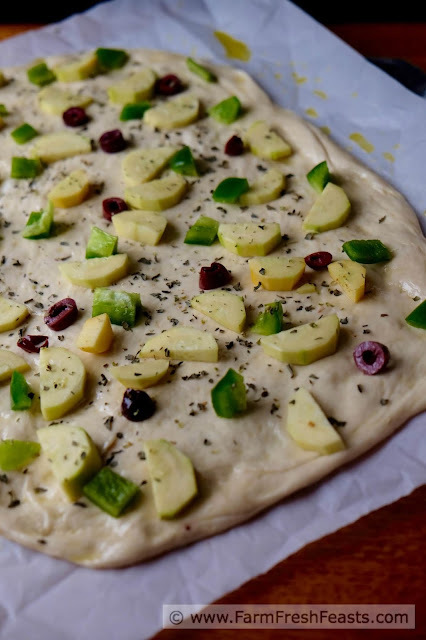 On an oiled piece of parchment paper, stretch out the dough to what it feels like being today. 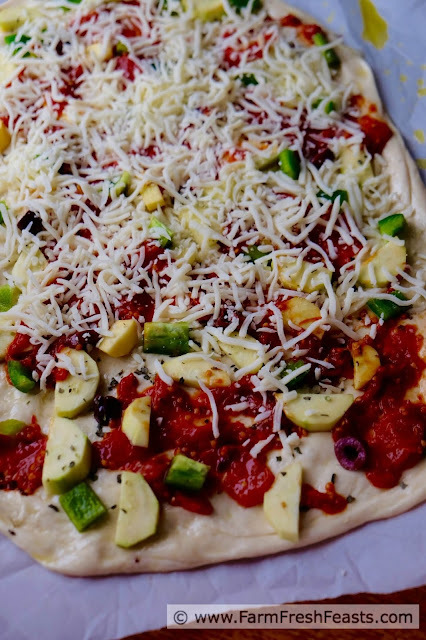 Brush the crust with a bit of olive oil, then scatter the chopped vegetables on top in an even layer. Sprinkle Italian seasoning over the vegetables, then spoon tomatoes into the empty spaces to evenly cover the dough. Cover with shredded cheese. Slide the whole thing, parchment and all, into the hot oven onto the preheated stone. Bake 5 to 8 minutes, then shimmy the pizza off the parchment and continue baking for another 3 to 5 minutes directly on the hot stone. 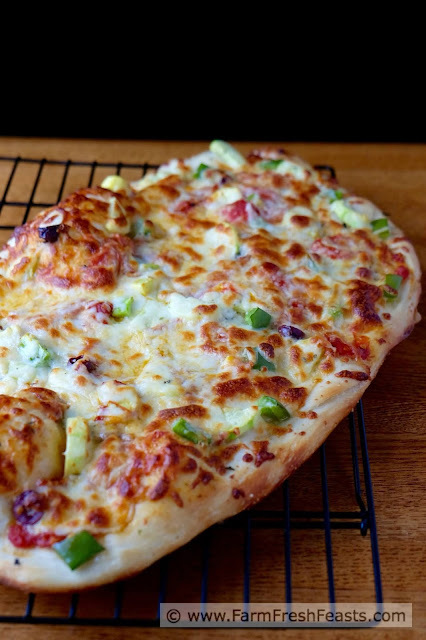 When the cheese is browned and bubbly, remove the pizza to a cooling rack and let rest for 5 minutes before slicing. While I haven't been canning the tomatoes, I have been slow roasting them and pureeing the output for future pizzas, pasta sauces, and soups. It's been a great way to use up all my tomatoes this year since I suddenly have no interest in eating them raw. Long story. 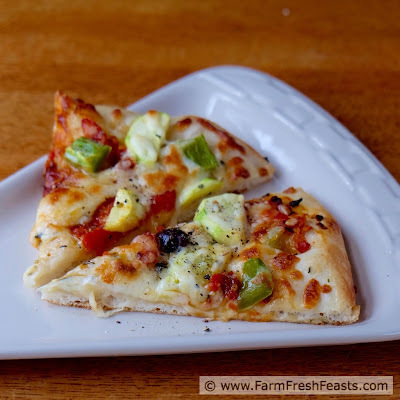 I've done so many things with my tomatoes--from eating them raw to freezing them whole to canning plain tomatoes to canning pizza sauce and salsa. Lots of salsa. Looking forward to the story, my friend!